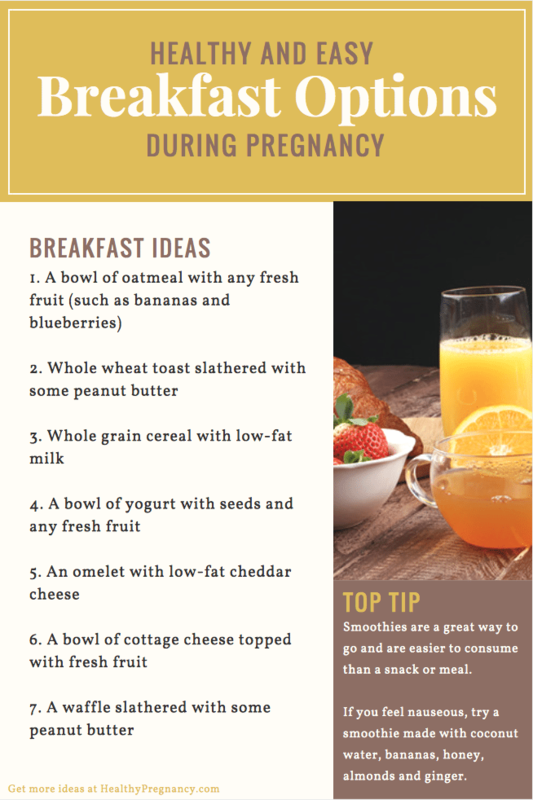 Healthy and easy breakfast options while you are pregnant. Breakfast ideas to soothe morning sickness and obtain proper nutrition. Eating right while pregnant is one of the best things that can be done for your baby. Some of the best options for breakfast for optimal nutrition include incorporating whole grains, dairy, protein and fruit into your meal. Pregnant women should aim to add 300 calories to their typical diet. While you are pregnant, whole grains are a much more valuable source of nutrition for your baby than refined sugar. Making the choice of eating a slice of whole grain bread versus white bread will help you feel full longer and boost your energy levels. Many whole grains are fortified with folate that can help prevent neural tube defects in your baby and boost your baby’s blood supply. Eating dairy while pregnant can help provide your baby with the calcium he or she needs to develop strong bones, muscles and nerves. Finding and eating foods that are fortified with calcium (such as orange juice) can also provide you and your baby with high levels of vitamin C. Vitamin C will help keep both you and your baby’s immune system strong. Next, consuming protein and fresh fruit will help the development of your baby. Eating protein is especially vital during the second and third trimester because at this point your baby is growing very fast. Fruit is a great way to implement fiber into your diet, which will keep you full and boost your energy levels. Moreover, the fiber from fruit will help prevent constipation—a common problem pregnant women face. It will also provide you and your baby with vitamins and minerals such as vitamin C, folate, potassium and more, which will support a healthy baby. If morning sickness is an issue, there are definitely foods you can still eat that will make you feel good. While everybody is different, there surely will be something valuable here that will help you feel less nauseous. Drinking fresh ginger boiled in water with a small amount of sugar is a definite way to settle your stomach. Once your stomach is a bit settled, try eating calming foods like peanut butter and apple slices. Smoothies are also a great way to go and are easier to consume than a snack or meal sometimes. If you feel nauseous, try a smoothie made with coconut water, bananas, honey, almonds and ginger. The coconut water will help balance electrolytes, the bananas and ginger will settle your stomach and the almonds will provide you with protein. Specific foods can work to your advantage when eaten during the first, second and third trimester. During your first trimester, foods that are high in folate are very important because this is when your baby’s nervous system is developing. Also, implementing foods that are rich in vitamin B6 can help ease nausea that may present itself in the first trimester. For example, try bran flakes with milk and bananas alongside a glass of cranberry juice. During your second trimester, it is very important to eat foods rich in omega-3 fatty acids, calcium and vitamin D to help your baby grow strong bones, teeth and aid in brain development. Try some Greek yogurt drizzled with flaxseed oil, dried fruit and almonds paired with a glass of orange juice for breakfast. Lastly, during your third trimester, you will need foods that will boost your energy and provide you with the vitamin K needed to heal your body after your baby is born. Try a leafy green smoothie made by blending 2 cups of spinach, 2 cups of coconut water, 1 banana, 1 cup of pineapple, 1 cup of uncooked carrots and 2 tablespoons of chia seeds to get the vitamin K you and your baby need.